The need for improved geologic information is ever increasing as environmental and land-use issues continue to grow, with particular relevance to water resources. In northeast Illinois, bedrock aquifers are under regional stress and Lake Michigan sources are nearly fully allocated. Thus, McHenry County has responded with proactive water-resources planning. 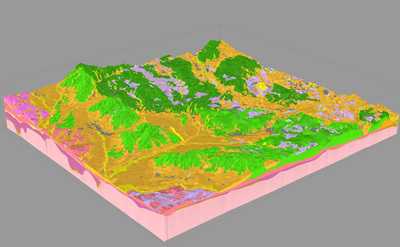 In cooperation with the County, the ISGS is in the final stages of completing a county-wide 3-D geologic model of the glacial deposits, which include the shallow sand and gravel aquifers. McHenry County is completely dependent on groundwater for its water supply, and nearly 60% of municipal water supplies in the county are derived from the glacial sand and gravel aquifers. The eastern portion of McHenry County is already undergoing significant groundwater-resource stress due to suburban expansion, while the western portion of the county needs a better understanding of their aquifer systems to support local and regional groundwater supply protection decisions. Thus, the sand and gravel aquifers are atop the list of natural resource sustainability concerns, and the results of this project will help regional and local officials make wiser decisions related to their water supply needs.